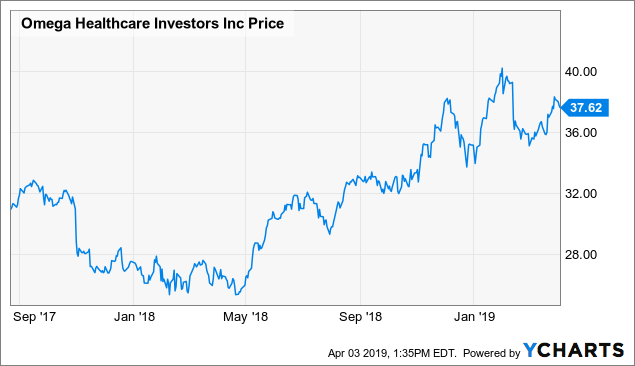 It has been over a year and a half since I first wrote about Omega Healthcare Investors (OHI), determining that it was a value trap. In that article, I predicted that the company would slow or stop its dividend raises, but had confidence that it would not be reduced. Two quarters later, OHI froze its dividend increases. Since then, its AFFO has dropped. The company missed its guidance of $3.42 in 2017, which came in at only $3.30/share. Then, in 2018, AFFO dropped to $3.04. For 2019, guidance is for AFFO of $3.00-3.12; if met, that would make the REIT’s AFFO/share equivalent to its 2015 results. Despite the drop in AFFO, OHI common shares have rebounded strongly. Despite AFFO dropping almost 10%, the share price has increased by over 20%. It did take a dive initially when Orianna filed bankruptcy, but the bulls have been in control and are pushing the pedal to the metal. OHI is trading at 12x projected 2019 AFFO. Looking at P/Guided AFFO on March 31st, we can see that OHI has consistently traded from 9x to 12x at this time of year. The current price is towards the upper end of that range. This tells me that the market is confident that OHI’s troubles are behind it, and that the company will beat guidance or, at the minimum, provide better growth next year. Neither one is a safe bet. One of my consistent warnings about OHI has been that the tenants are suffering from declining fundamentals. The REIT has had problems with several of its top ten tenants. In addition to Orianna (formerly known as Ark) filing bankruptcy, OHI has reduced Signature’s rent by over $10 million, plus gave it a $10 million loan to pay for operating expenses. It has extended over $71 million in loans to Genesis Healthcare (GEN), with a substantial portion of the interest being paid-in-kind (PIK), which means that OHI is receiving warrants for GEN common shares. Additionally, $5.4 million of the $33.8 million of contractual receivables outstanding – net of allowances as of December 31, 2018, relates to one operator that continues to pay, although at times less than the monthly contractual rent due. We continue to monitor this operator, including their contractual payments and their operational performance to determine if it will impact our revenue recognition in future periods. These cracks are being completely ignored by the market. The bullishness in OHI is especially surprising when other similar REITs have been rocked by tenant defaults. Sabra Health Care REIT (SBRA) dropped in November when Senior Care Centers defaulted. 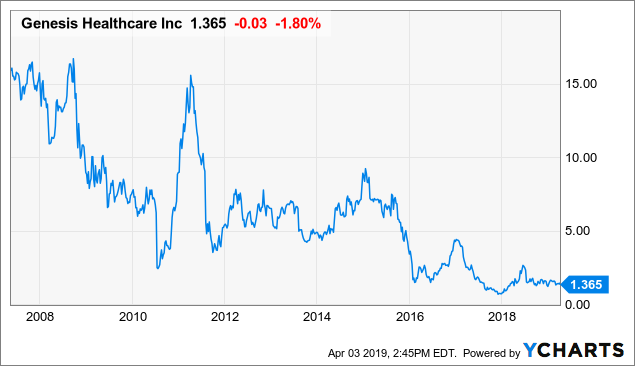 Senior Housing Properties Trust (SNH) plummeted when it had to restructure its arrangement with Five Star Senior Living (FVE). SNH is taking much greater control of the properties and becoming a majority shareholder of the tenant. Blurring the line between landlord and tenant, SNH is now much more exposed to market fluctuations. MedEquities Realty Trust (MRT) dropped when OnPointe Health, one of its major tenants, went bankrupt, and the new tenant pays substantially lower rent. OHI is in the process of acquiring MRT now, which will add struggling operator Fundamental Healthcare to its roster. OHI bulls seem convinced that it won’t happen to the company (again). Perhaps the single biggest warning sign for OHI investors ought to be GEN. The market sees the risk of GEN as a company with shares trading at penny stock levels. GEN accounts for 7.5% of OHI’s revenues, making it even larger than Orianna was. The market is flashing a big red warning sign about GEN – a sign that is completely being ignored. 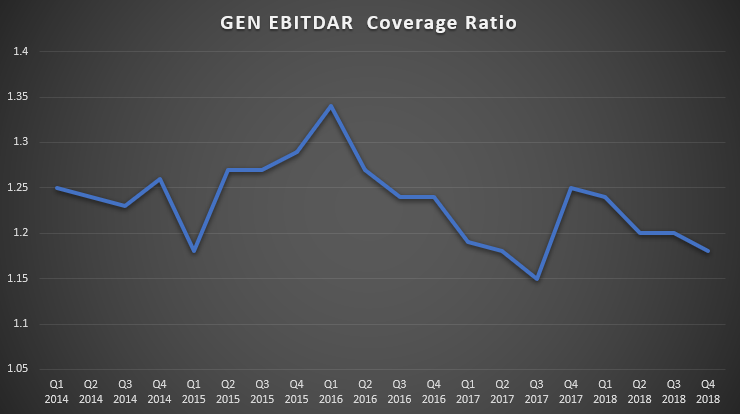 More critical for OHI is that GEN’s coverage ratio has continued to decline. The decline since 2016 was steady, interrupted by substantial rent reductions, only to resume declining through 2018. Lenders have been paying attention: GEN’s asset-based lending revolving facility is at LIBOR +600 bps, additionally the agreement comes with several protective features such as a “springing maturity” that makes it due 90 days prior if its Term Loan Agreements, Welltower Real Estate Loans or Midcap Real Estate Loans fail to be extended or refinanced. In other words, the ABL has to be paid first (before OHI gets its own). The revolving credit facility includes a swinging lockbox arrangement whereby we transfer all funds deposited within designated lockboxes to MidCap on a daily basis and then draw from the revolving credit facility as needed. These types of arrangements come from lenders who believe there is a strong possibility that GEN is going to default. As of December 31st, GEN only had a borrowing base of $436.9 million and $430.6 million in borrowings under the credit facility, leaving it with only $6.3 million in borrowing capacity and only $20.8 million in unrestricted cash. The bulk of GEN’s cash ($121 million) has been put in restricted accounts. Some of that cash is limited to paying insurance claims through its self-insurance program. 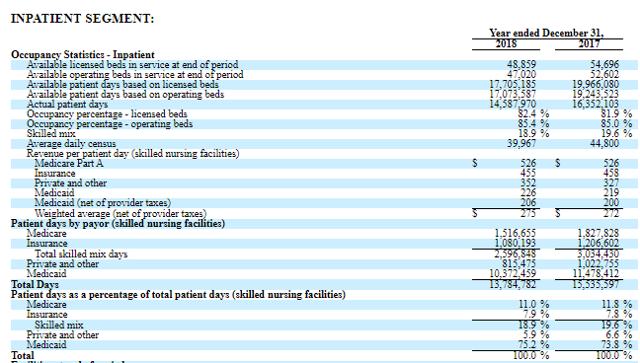 Per the 10-K, the company’s total liquidity is only $93.8 million. Any interruption of its operations, revenues or an increase in expenses could be catastrophic for GEN. There is a big change headed towards senior healthcare known as the “Patient Driven Payment Model,” or PDPM. This changes the model for Medicare reimbursements. The motivation for the government is to move away from a system which incentivizes volume to a system which is (theoretically) more centered on the needs of the patient. There is a raging debate over what it means for skilled nursing facility (NYSE:SNF) operators. It is not really known what the impact is going to be when it is put into practice, and the impacts will likely vary from operator to operator depending on the particular mix of patients. We currently estimate that PDPM will reduce the top line of our rehab segment between 10% to 12%. This revenue contraction is related to the expected use of more cost-effective methods of delivery such as group and concurrent therapy. And will come with a corresponding reduction in operating costs that will substantially mitigate the impact of lower revenues. The company’s rehab segment accounted for $889 million in revenue in 2018 and has one of the best EBITDA margins at 11.4%. The reduction might be offset by decreasing expenses slightly improving the margin, but the rehab segment was already trending down with a 9.2% decrease from 2017. Additionally, the government has implemented the SNF-Value Based Purchasing program, which withholds 2% of Medicare payments and distributes it based on an SNF’s score (based on hospital “potentially preventable readmissions” within 30 days) relative to its peers. In its 10-K, GEN is predicting that it is a net loser in this program. The FY 2019 SNF PPS Rules reiterate the SNF-VBP program instructions and affirm that effective October 1, 2018, skilled nursing facilities now experience a 2.0% withholding to fund the incentive payment pool. Simultaneously, based upon performance, skilled nursing facilities have an opportunity to have their reimbursement rates adjusted for incentive payments based on their performance under the SNF-VBP Program. Of the 2.0% withheld under the SNF-VBP Program, we expect to retain 1.3% based on performance. This provides an opportunity for improvement, but it also introduces a risk of greater losses. GEN’s average daily census has increased slightly and was up YoY from November 2018 through February 2019. This only tells part of the story – to really understand the issue, we also need to consider the “skill mix,” which is how many patients are being paid for with Medicare versus the much lower-paying Medicaid. 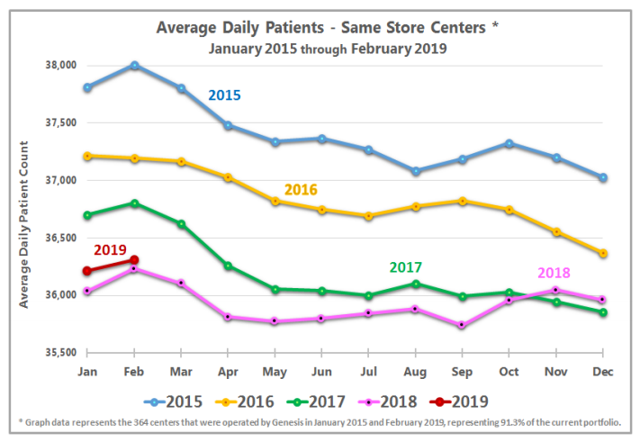 On the census, with respect to patient mix and occupancy, skilled days mix in 4Q, 2018 of 18.1% decline 60 basis points from the prior year quarter. As a result, a 2% increase in occupancy would only result in approximately a 1% increase in gross revenues. By the time you factor in the much lower (sometimes negative) margins of Medicaid, an increase in occupancy could actually drive lower EBITDA. OHI bulls have been in control of the share price. They have driven it up to historically high levels in terms of price/AFFO. This is occurring despite management guiding for lower AFFO in 2019, and despite OHI already making concessions for several of its top 10 tenants and three significant tenants that are behind in rent. The fundamentals of the SNF industry are terrible. Operators are being pressured by long-term occupancy declines and a substantial shift from Medicare to the lower-paying Managed Medicare and Medicaid. These pressures have caused several operators to go into bankruptcy, which rocked several of OHI’s competitors. There are several potential weaknesses in OHI’s portfolio, including Signature, Daybreak and, when it closes the MRT transaction, Fundamental Healthcare. Perhaps one of the biggest potential hits would be GEN. With its ABL lender having a lockbox, a GEN default would mean an immediate loss of cash flow from its $71 million in outstanding loans. It would also risk the $59 million in annual rent – which, if history is any guide, could be expected to be reduced 30-40% upon transitioning to a new operator. 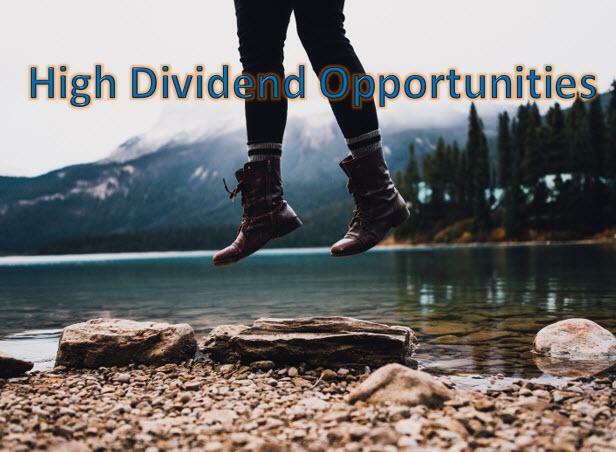 With OHI projecting to pay out nearly 100% of FAD in 2019, any disruption of cash flows puts the dividend at risk. A default from GEN would almost certainly necessitate a dividend cut. GEN accounts for more rent than Orianna did in 2016. OHI is a very high-risk investment right now. What investors can see of GEN’s finances should terrify them, and it is likely that the financials of private companies like Signature and Daybreak are similar. It is impossible to say exactly when, but it is only a matter of time before OHI announces the restructuring of another major tenant. OHI stock should be avoided, and at current prices, it is a great time to take profits. We are the largest community of income investors and retirees with over 2000 members. We recently launched our all-Preferred Stock & Bond portfolio to cater for conservative income investors. Disclosure: I am/we are short OHI. I wrote this article myself, and it expresses my own opinions. I am not receiving compensation for it (other than from Seeking Alpha). I have no business relationship with any company whose stock is mentioned in this article. Additional disclosure: Beyond Saving is short OHI via January 2020 Put Options. HDO does not have a position.